Ensuring great system sound in the great outdoors. Cardinal O’Hara’s Lions Stadium in Springfield, PA.
A Community dSPEC DSP provides loudspeaker management and system equalization. For audio, the great outdoors often are anything but. From wind that literally blows away high frequencies to the need to keep sound from annoying neighboring offices and homes, outdoor events are filled with challenges. The good news is that there’s no shortage of technologies and tips for ensuring consistently great sound at outdoor venues such as amphitheaters and stadiums. Here are four to consider. Mid and high frequencies are most susceptible to environmental conditions. So keep an eye on the weather when setting equalization. High frequencies also are vulnerable to humidity. Having time delay spectrum independent helps on humid days. “You should be doing time delays separately for low frequencies than high frequencies,” O’Connor said. Don’t have the time or trained staff to tweak the system before every event? Consider processor presets, which enabled less technical people— such as theater-workshop volunteers—to hit a few buttons based on the weather. The bigger the facility, such as a stadium, the more loudspeakers, amps, drivers and other components there are running during an event. That means more opportunities for something to fail. Instead of waiting for staff or, worse, patrons to alert you that something is out, consider budgeting for a telemetry system. This gear provides information about each remote device, such as a loudspeaker’s impedance, temperature and output level. Amphitheaters and stadiums often are surrounded by homes and businesses. In some cases, it’s because the city expanded out to a previously remote location. In other cases, they were put there recently in order to spur redevelopment in a blighted area. Either way, those locations inevitably mean that some event sound will spill into adjacent areas. There’s nothing you can do about crowd noise, but announcements and music can be reined in. For example, vendors such as Meyer Sound make beamsteered column arrays. These also control the back lobe of the beam so it’s not arrowing out into town. Pay attention to the ages of the adjacent buildings. For example, Maryland’s Annapolis Summer Garden Theatre is located in an historic downtown, where many buildings have single-pane windows and no insulation. As a result, simply cranking up the volume to overcome marina noise wasn’t an option. Instead, the theater used a combination of modeling and loudspeakers on trusses to get sound where it needed to go – and only there. Products that provide tight control over sound also make it easier to deliver clear, sufficiently loud sound throughout a facility but without blowing away the people sitting by the loudspeakers. For example, if a loudspeaker has a high degree of pattern control to keep the sound focused on the farther distance, the people seated near the array won’t be subject to uncomfortably loud sound. That control is particularly valuable for facilities where advertising and architectural features force loudspeakers to be relegated to one or a handful of locations. The opposite also can cause problems, such as when loudspeakers are added to light poles because it’s cheaper or easier than installing dedicated structures. Although those high locations often enable the loudspeakers to provide uniform coverage, patrons seated in areas where multiple speakers overlap often experience intelligibility problems. Cardinal O’Hara, a Catholic High School in Springfield, PA, is known for the legacy of its sports, music, and academic programs. As the only Philadelphia Catholic League school with a home football stadium on school premises, Cardinal O’Hara’s Lions Stadium has large home and visitors bleachers, an enclosed press box, an artificial turf field and a modern track. 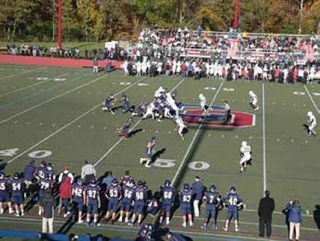 In 2012 Cardinal O’Hara added outdoor lighting for night games and, recently, they replaced an outdated paging horn system with a new audio system using Community R-Series Loudspeakers.